The San Francisco Bay Wildlife Society is a not-for-profit 501(c)(3) Friends group, authorized by Congress to support the education, interpretation, and research activities of the U.S. Fish and Wildlife Service. The San Francisco Bay Wildlife Society (SFBWS) is based at the Don Edwards San Francisco Bay National Wildlife Refuge off Thornton Avenue. Since 1987 SFBWS has been assisting the Refuge with financial support. Governed by a volunteer Board of Directors, the Society is supported by nearly 400 individual members and by donations and grants from corporations, foundations and local government agencies. SFBWS operates Nature Stores at the Don Edwards San Francisco Bay Refuge Visitor Center in Fremont and the Environmental Education Center in Alviso. 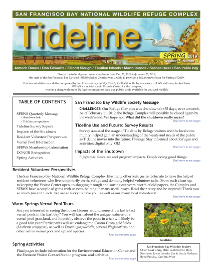 The Tideline, a 16 page quarterly magazine, published by SFBWS on behalf of the Don Edwards S.F. Bay Refuge, lists the Refuge activities available to the public for the coming four months, along with articles on flora and fauna found on the Refuge Complex properties. There is no charge for this publication and it is sent to members of SFBWS. Other publications of SFBWS are: Exploring Our Bayland by Diane R. Conradson and Drawbridge, California, A Hand-Me-Down History by O. L. "Monty" Dewey, tells the story of Drawbridge, the ghost town in the bay. In addition to publishing, SFBWS supports and makes possible annual summer camps at Fremont, Alviso and East Palo Alto. SFBWS employs two environmental specialists at the Environmental Education Center in Alviso. These employees conduct programs for school children and the general public to increase awareness of urban runoff pollution into the south San Francisco Bay and to promote personal behavior changes that will prevent pollution. Currently the San Francisco Bay Wildlife Society is funding the Alviso area of the Don Edwards San Francisco Bay National Wildlife Refuge. This portion of the trail, when completed, will connect Sunnyvale Baylands and Mountain View Shoreline. The Visitor Center at the Fremont Refuge facility highlights the San Francisco Bay salt pond restoration program, with emphasis on the role the salt marshes play in maintaining a healthy bay. San Francisco Bay Wildlife Society has donated substantial funding for the purpose of having hands-on, high tech exhibits explaining the steps in the Salt Pond restoration project. We invite you to visit the Refuge, walk the trails and visit our Bookstore. The Don Edwards San Francisco National Wildlife Refuge is the largest urban Refuge in the country; surrounded by major freeways, it remains a peaceful island in an urban sea. 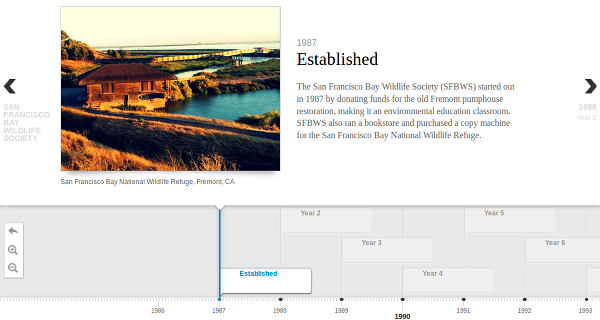 Here's a look back at the last 30-odd years of the San Francisco Bay Wildlife Society. Please click here to view an interactive time line of our organization's history. Interactive timeline of SFBWS history and accomplishments. 1987: Donated funds for old Fremont pumphouse restoration, making it an environmental education classroom. Runs bookstore & purchased a copy machine for Refuge. 1988: Bought first computer at Refuge. Established bookstore at Klamath Basin NWR. Began publishing The Tideline. Established Explorer post (Boy Scouts) with emphasis on conservation & natural resources. 1989: Published Drawbridge, A Hand-Me-Down History. Began Exploring The Wilds seminars. Purchased computer and slide projector for EEC. Held first Winter Wildlife Arts & Crafts sale. 1990: Klamath Basin & Sacramento NWRs became part of SFBWS scope. Established bookstore at Sacramento NWR. Funded Summer Art Academy. Published Wetland Wildlife Viewing Guide with funding from several grant. Purchased another computer for Fremont site. Purchased electron microscope for Pumphouse classroom and Bio-Scope for EEC. 1991: Began financial support of NWR Volunteer program. 1992: Purchased a laser printer for Refuge. Part-time environmental education employees hired to keep Alviso EEC open n weekends. Positions funded with grants from the City of San Jose and Santa Clara Valley Urban Runoff Pollution Prevention Program. 1993: Funded Latin American Internship for Hopper Mountain Condor Recovery Program through grant agreement with FWS. Malheur Wildlife Refuge, Oregon, added to SFBWS scope. Purchased a laptop computer for the Refuge. 1994: Hired Program Administrator to support growing needs of 7 programs. 1995: Grant funded up-grade EEC Pavilion & new EEC Butterfly Garden. Santa Clara Valley Urban Runoff Pollution Prevention program expanded to full time position. 1996: Funded EEC Disabled Access Pathway. Published Endangered Species brochure. Purchased a video microscope for Pumphouse, a lamination machine and funded mural in the Fremont Pavilion. Salt Marsh Manual developed as a tool for teacher training for class room visits to the Refuge. 1997: Funded summer camps at Fremont and Alviso. Began fundraising for EEC new boardwalk. City of San Jose grant position expanded to full time. 1998: Work started on the EEC Boardwalk in February. An agreement with SCVURPP program permits hiring full time environmental educator to develop Watershed Watchers program for school children and adults. Videomicroscope purchased for EEC. 1999: Grant funding supported development of video to train teachers on how to conduct a Refuge Field Trip. Puppet program developed, promoting water conservation. Received first grant to fund Bair Island Restoration and Management Plan. 2000: South county watershed poster developed for educators. Portable outreach display developed for 7 Refuges in San Francisco Bay NWR Complex. Work initiated for restoration of Entry Triangle and signage at Fremont. Work continues on Bair Island Restoration and Management program. Interpretive panels developed for Boardwalk at EEC. Greenhouse for Native Plant Nursery was constructed at Fremont for propagating native plants for restoration programs. Summer camps continue. Bair Island Restoration and Management plan contract finalized and work begins. 2001: Funding for Antioch Dunes restoration work initiated. Actual model of south bay watershed area developed for EEC. Summer camps continued. 2002: Begin upgrading trails at Fremont to make them more accessible to people with mobility limitations. Funds become available to have a camp in East Palo Alto, besides regular camps. 2003: 100th anniversary Celebration of the National Wildlife Refuge System. Tidelands Trail upgraded for wheelchair access. Current membership fees initiated for first time. 2004: Out-of-area NWRs (Klamath, Malheur, Salton Sea & Ruby Lake) had established Friends Groups & began managing their bookstores. 2005: Work begun on Bay Trail extension near Moffett Field. Began upgrading Harrier Spur Trail. Funded development of EnvEd & habitat enhancements at San Pablo Bay NWR. Funded outreach work for Devils Slide & Farallon Islands. 2006: Began restoring EEC Upland habitat. Development Plan for Bair Island completed. Received funding for Fremont site trail maps. 2007: Grant supported native plant nursery at San Pablo Bay Refuge and implement the 2007 native plant project at San Pablo and Marin Island. New Refuge trail maps printed for Fremont area. Tideline design updated. 2008: Supported second South Bay Science Symposium. Provided funding for interpretive displays in new temporary Fremont Visitor Center. Grants received to begin two year study & upgrade program for high ecotone area at EEC. 2009: New EEC area trail map printed. Began upgrade of displays in EEC Auditorium using local artists. 2010: Funded two interpretive garden panels at EEC. Sponsored Toast A Duck event for National Wildlife Refuge Week. Supplied grant for Student Ambassador representing Society at scientific events in Bay Area. 2011: Board reviewed mission & future direction of Society. Provided bike racks at both Fremont & EEC. A new shade shelter, rain ponchos and Magiscopes were purchased for use by school children attending NWR EnvEd programs. Funding for Student Ambassador renewed. 2012: Began support of Yellow Bus Fund for transporting students to Refuge. A17 levee breached at Coyote Creek. Supported FWS volunteers with monies for volunteer banquet and teacher training. Purchased new tables for EEC. Two year contract with City of San Jose signed for Living Wetlands programs. SCVURPPP continues supoprt of Watershed Watchers. Supported Bay Nature Special Supplement, Look How Far We’ve Come, in the September 2013 issue of the magazine. 2013: Government shutdown in October 2013. Programs cancelled for first time. Intern program is changing with new rules from Dept. of Interior. Continued support of Yellow Bus Fund. Bookstore sales declining; temporarily closed with new requirements for SFBWS employees/volunteers as cashiers. Strategic Planning began earlier in year. 2014: Move to Friends organization from Cooperating Association begins. Grant writer obtained to obtain new sources of funding. Supported publication of June 2015 public release of the Baylands Ecosystem Habitat Goals Update. 2015: SFBWS becomes a Friends group formally with contract approval in late 2015. Working to reopen the Nature Stores.